It’s a lot of fun, especially if website metrics is your cup of tea. You can read the official blog post or Barry Schwartz did a write-up as well. The comments are pointing out that some sites might not have much/any data. I think that that’s mainly because there’s a minimum threshold of traffic before Trends is willing to show statistics for a site — bear in mind that this is a launch on Google Labs. But you can still do some fun analysis with Trends for Websites, even though it’s in Google Labs. And it is free, so give it a try. Tonight I went to a meet-up of Bay Area Blawgers (a blawger is a law blogger). Why did I go to this, when I normally don’t do blogger meet-up kinda stuff and don’t know much about law? Well, the get together was just a little down the road at Santa Clara University. And the shindig was coordinated by Eric Goldman. I’ve mentioned before that I enjoy reading Eric’s blog for coverage of web legal issues. I came in just before things started and happened to luck into sitting by several neat people. On my right was Mike Masnick of Techdirt fame. If you don’t browse Techdirt from time to time — dude, you need to read fewer SEO blogs and broaden your horizons. 🙂 Mike and the writers at Techdirt provide an independent take on news items. Mike’s got a long memory (like Danny Sullivan, but with general news), so he does a good job of putting news items into perspective. In my experience, Techdirt does a deeper level of analysis than most sites, so when Techdirt rakes Google over the coals for something, I tend to give that critique more weight. To Mike’s right was Kurt Opsahl of the Electronic Frontier Foundation. My advance planning for the meet-up consisted of wearing my EFF T-shirt, so all that hard planning paid off. Kurt polled the group on interesting questions about the DMCA (“How many of you have gotten a DMCA takedown notice?”). Afterwards, he talked about the info on this page where you can register as an online service provider with the U.S. Copyright. It’s a one-page form and an $80 fee. We also talked briefly about Google’s decision to anonymize our logs data after 18-24 months. I still hope to circle back around to that topic at some point (I’m a fan of the decision). – I didn’t realize that Sun’s general counsel is a blogger. – We discussed whether it was better for a law blogger to mention legal cases that could be negative for a firm (it definitely bolsters your credibility as a blogger). We also talked about the pros and cons of anonymous blogging, and a little bit about online bullying. – Chris Hoofnagle was there. I hadn’t seen Chris since the Computers, Freedom & Privacy Conference in Berkeley in 2004. Which reminds me: I want to hit some non-SEO conferences this year. Maybe Defcon or SIGGRAPH. In a long-awaited and dramatic decision, the Supreme Court held today, unanimously, that in the context of the Guam Organic Act’s debt-limitation provision, 48 U.S.C. section 1423a, Guam’s debt limitation must be calculated according to the assessed valuation of property in Guam. Like we didn’t all see that coming. In your face, Supreme Court of Guam! I think a good time was had by all. Thanks for pulling so many blawgers together, Eric. That number of visits (~1.7M) helps explain why I try to avoid site-specific comments and try to stick to general topics. The spikes in my traffic graph were (I think) talking about international webspam and two or three posts that got dugg. The diggage happened during the week that my wife was out of town and I had a lot of free time to blog. I have a fair number of repeat visitors from all over the world. About 1/4th of people come directly to my site and about 1/3rd reach it through Google. Those digg spikes look impressive, but digg only accounted for about 2% of my traffic throughout the year. Let’s see which posts were the most popular this year. Looking down the list, lots of people check my blog page or the root page of my domain. 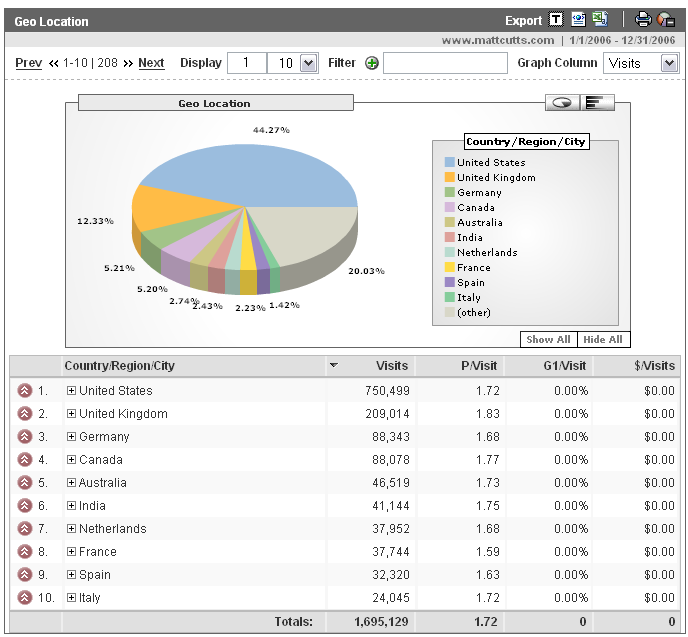 Over 18% of my traffic is from non-English browsers (! 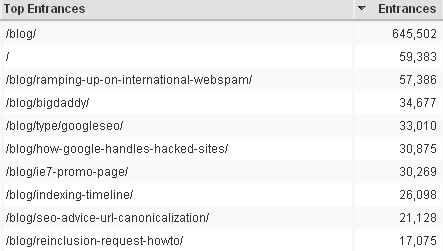 ), so it’s not a surprise that international spam is a popular topic. If you want only Google-related posts and no cat posts, http://www.mattcutts.com/blog/type/googleseo is the best url to use. Looking at that url up above, it seems a fair amount of people use that ability to view only the Google/SEO category. For feedreaders, http://www.mattcutts.com/blog/type/googleseo/feed/ is the best url to get a Google/SEO-only RSS feed of my blog. That serves as a good reminder that people usually don’t type the same phrase to find information. If you’re an SEO or site owner, don’t just chase after a “trophy phrase”; think about the long tail of queries, too. You should think of the words that people will type and make sure you include the right ones in your article in a natural way. Including the right/relevant words on the page in the first place is something that a lot of people forget. Read my post about writing useful articles with good SEO practices if you want to hear more. I write a techie-heavy blog that talks about Google issues, so I wouldn’t expect to see much (any?) traffic from other search engines. But the sheer number of different sites that sent traffic is pretty wild. I got more referral traffic from Bloglines (22636 visits) than from Yahoo (17591), which makes sense given that a ton of people skip the site and read my full-text feed. But other sources were surprising drivers of traffic. 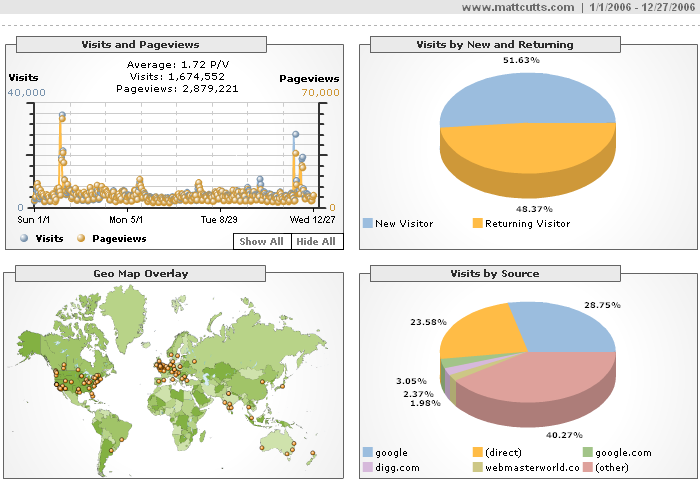 The Search Engine Watch blog drove more traffic (15916 visits) than MSN (13554). Ask sent 820 visits, which was a tie with Steve Bryant over at eWeek’s Google Watch site. And that in turn was a little more than Oilman (789 visits) and a little less than cre8asiteforums.com at 1253 visits. What this says to me is that there’s a lot of traffic beyond search engines, and I’m not just talking about social media optimization such as submitting stories to Slashdot/TailRank/Reddit/Digg/SearchMob. Just getting out there, talking on the web, and getting your name known in an industry can make a big difference. Over the last 18 months or so, being a webmaster myself and writing a blog has taught me a lot. I understand more of the issues that site owners run into, and I sympathize with the frustrations of running a site. I think that using AdWords would also be an eye-opening and useful experience. I’m torn though, because I only have a limited amount of time in my day. If anything, I need to be spending less time blogging and more time with my family. I’ve also avoided AdSense, other types of advertising, and even “subscribe to my feed, tag this post, digg this page, share me on facebook” stuff because I wanted my site to be purely informational. But the net effect is that the blog is pretty austere (spartan? plain? ugly?). Vanessa Fox and Adam Lasnik have done an amazing job this year on both the Google webmaster blog and the Google Discussion Group for webmasters. This year I posted on a wide range of SEO topics, and advanced topics are more fun to talk about, but going forward I think it would be a good idea to cover more intro-level material. I think within Google there’s solid awareness that blogging can be hugely helpful to discuss issues informally, answer questions, and dispel misconceptions. I’d like to encourage even more Googlers to blog. The issue is how to build trust that a Googler can talk about issues with finesse. I’m lucky because as an old-timer Googler, I made my public mistakes back when hardly anyone was watching (remind me to tell my Paul Boutin/Wired story sometime). I think we need more Googlers blogging and checking the blogosphere for mentions of their respective products. I’m not 100% sure how to get there, but I think it needs to happen. I also wish I had more stats on my feeds. I should probably sign up for something like FeedBurner, but I hate the idea of losing control of my feed urls. Also, I got some initial data from FeedBurner: 11,950 subscribers and 5,149 reach (that’s people who clicked or viewed the content of my feed). Bloglines’ web interface has pegged me at 1,216 subscribers but Feedburner claims that I have 3,409 Bloglines readers. I’m not sure how to reconcile that. I was getting discouraged that Bloglines kept saying 1,100 to 1,200 subscribers for most of 2006 in its web interface, and I really felt like I had more than that. Anyone have guesses about what’s causing the Bloglines/Feedburner disparity? Gary Price, want to ask around? Earlier this week, I sat down and wrote for about 40 minutes about hacked sites, then promptly lost that post forever because my webhost’s database machine was pokey right then. My fault for running Firefox 1.5 on my laptop instead of 2.0. WordPress 2.1 will also have autosave built in. My breath is definitely bated for the WordPress autosave feature. I tried not to let my inner snark out, but it’s been a couple days, so I figure I’ll let out just a little bit of grump. Okay, how about offers or other deals? Compete says that they’re the “first service to identify available deal codes as you enter a retail website.” I can honestly say that of all the people I’ve talked to, I don’t remember anyone asking “Why don’t you tell me in the search results whether a site offers coupon codes?” I tried a search like [coupon codes] and none of the results triggered as offering promotion codes. So I did the search [fat wallet], and fatwallet.org isn’t listed as having any deals or coupon codes. That doesn’t seem right. Let’s talk about Compete Picks. The idea behind the feature is for a search, Compete looks at the results and if there’s a lot of post-click page views or other activity on a site, then that site might be a better match. So for some queries, you’ll see “Compete Picks” where Compete thinks the results are especially helpful. Am I being too harsh on Compete? I’m guessing so–after all, I’m getting some snarkiness out. But on their launch announcement they claim to be the “first social search solution leveraging community click-stream information to enhance search results.” Really? Because Danny Sullivan wrote about DirectHit in 1998, and I distinctly remember when DirectHit leveraged community click-stream information for HotBot back in the day. So what’s left? Metrics. That whooshing sound you hear is all the SEOs going to install the Compete Toolbar. Compete claims 2 million users help it compute metrics, and I’d be very surprised if all those participants were toolbar users. Yep, digging through the FAQ, they mention “ISP relationships,” which presumably means that they’re buying user data from ISPs. ISP relationships can be a huge source of metrics bias. For example, some ISPs partner with Yahoo, and users on those ISPs are probably more likely to visit Yahoo. Other ISPs partner with Google. And savvy users that use smaller providers such as Covad or Speakeasy are likely not counted at all. Because you don’t know which ISPs are selling user data to companies such as Compete or Hitwise, you don’t know what biases are baked into those companies’ metrics–and the metrics companies won’t tell you. Maybe I’m cynical about metrics lately, but Rand Fishkin looked into this recently. He got data from 25 blogs (including mine) and then compared that data with a bunch of metrics services (including Compete). His conclusion? “Based on the evidence we’ve gathered here, it’s safe to say that no external metric, traffic prediction service or ranking system available on the web today provides any accuracy when compared with real numbers. … The sad conclusion is that right now, no publicly available competitive analysis tool we’re aware of provides solid value.” Go read his post–it’s a good one. You have to ask what Compete brings to the table if Snap.com already tried using clickstream data. Okay, I’ll stop. It’s cool that Compete is trying new ways to inform their users with different icons. I like that they link to their blog from their main page. And it’s nice that they offer free metrics for sites. I just wish I had more confidence in Compete’s metrics, and I wish I knew which ISPs they get data from. To the folks at Compete, I’ll try to be in a more positive mood the next time we meet.